Fantasy Books Incorporated has been serving the Metro East area for over 30 years and our first St. Louis location opened in April of 2015. Fantasy Books I opened in 1980 in Collinsville Illinois and expanded to multiple stores during the heyday of comics. With the decline of comics in the early 90’s the Fantasy Books franchise was sold off to various owners, some of which still exist today under different names. Fantasy Books IV, the Belleville store, maintained the Fantasy Books name and reputation for outstanding customer service and broad product offering. In June of 2004 Steve Unverferth and Tony Favello purchased Fantasy Books, Belleville. Over the next two years Steve and Tony made improvements to the interior and exterior of the store as well as the product selection and customer service. 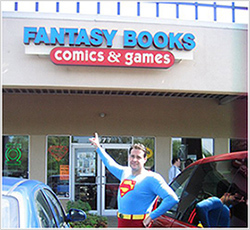 In August 2006, Steve and Tony bought Medieval Starship and changed the name to Fantasy Books and Games, O’Fallon. This purchase moved them into the Gaming business while keeping a Gaming store and space open on the East side. Fantasy Books and Games held its own for the next two years, and Steve and Tony expanded Fantasy Books again by purchasing the Fantasy Shop Fairveiw Heights location. 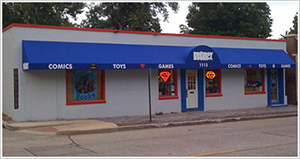 This combined comic book and gaming store acted as funnel location to the more product focused Belleville and O’Fallon locations. When the economy started to turn in 2010 and a larger location became available in O’Fallon Plaza, Steve and Tony decided to merge the O’Fallon and the Fairview Heights locations in February 2011. The result was Fantasy Books and Games, Fairview Heights, a super store location for both comic book and gaming enthusiasts. In the summer of 2011, Scott Croft, owner of Heroic Adventures, Edwardsville, approached Steve with an offer to purchase his store. Scott wanted to focus on his online business but still wanted a store in place for the Edwardsville customers. Steve and Tony added Heroic Adventures to the Fantasy Books Inc family in November 2011. Heroic Adventures is a combined comic book and gaming store that supports the college and local Edwardsville hobbyists. The most recent expansion of Fantasy Books Inc took place as a result of several St. Louis comic book stores closing in 2015, most importantly Star Clipper. When Steve and Tony learned Star Clipper was closing it became obvious to them that there would be a huge gap in the local comic book and gaming retail space. Since they were long time friends with Ben and AJ of Star Clipper, it made perfect sense to work together to keep Star Clipper alive in St. Louis. After some negotiations and searching, Steve and Tony decided to reopen Star Clipper on Washington Avenue, in the heart of St. Louis’ growing pop culture neighbourhood. All the Fantasy Books locations pride themselves on providing exceptional customer service, expansive product offerings, comfortable gaming space and anything else a comic book and gaming customer may want or need. And if we don’t have it we will do our best to get it for you. With 4 locations we have an unmatched ability to serve our customers. The goal of Fantasy Books is to be your number one choice for comic books, gaming products and collectibles. We hope to see you at one of our locations soon.